Our Analyst Index is still the only regular AR share of voice measure recognised by the industry. This month our Telecom Index is all about change. Nokia’s second month as number one has been challenged by Motorola and Nortel who have both raised their game and climbed onto the podium. Avaya has also put in a fantastic performance elevating itself by three places and gaining access to the fabled top ten. Ericsson, on the other hand, has nose-dived into fourth spot and both Cisco and Vodafone have put in a disappointing performances dropping one place each. The top 25 Telecoms Index has been equally dynamic. Qwest has stormed into the top 25 for the first time along with a interesting comeback by MCI, rising up 5 positions to take the 23rd spot despite its merger into Verizon. Greater praise must be given to AT&T who have shot up the rankings by 5 and presently occupy the number 12 spot. Unfortunately Sony Ericsson has plunged 6 places and France Telecom almost crashed out of the top 25. Research in Motion and O2 have fallen out of the August top 25. 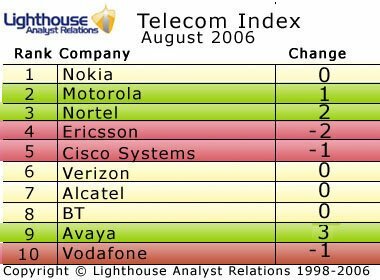 If you’d like to be sent the top 25 of the Lighthouse Telecoms Index each month, please send an email to analysts [at] lighthousear dot com. P.S. Spanish-reading visitors may be interested in this post, which references the Telecoms Index.